So here we go – my reflections on June and bullet journal set up for July! June Bullet Journal Set Up: What worked? Note: some of the links below may be affiliate links, which means if you happen to purchase something then I get a small commission at NO extra cost to you. Thanks for your support! As you saw in my June set up, there were quite a few things that worked out. The habit tracking – it certainly worked if not just to remind me how I really make mindless decisions! I ended up with about half the days successful with a “no soda” and “no spend” and about 18 days with a decent amount of sleep. I’m doing pretty well with cleaning a little bit every day, but would like to really commit to doing better this month. After finishing up my last insert, I started a new May Designs planning insert. It fits perfectly in my Foxy Notebook cover. I moved back into my dragonfruit cover for the summer because… pink. (If you are curious, this is a Classic No. 7, which fits 4 May Designs notebooks perfectly). 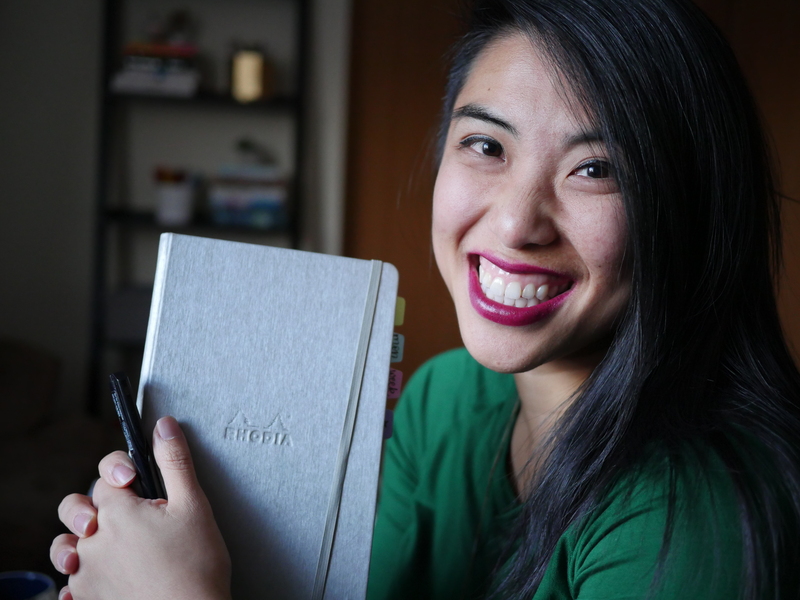 If you’re curious about May Designs, starting a bullet journal, check out my latest video! Goals Page. Every time I start a new insert, I want to stay rooted in my goals for the year. Too many new years resolutions have been left lying in the dust and since my inserts last around 3 months, it helps me re-center on these intentions I had. See more about how I set some of my goals through reflection, action planning, and annual goals. I’m using versatile hexagon stamps from Foxy Fix and colored pencils (brand unknown) that were gifted by my sister in law. Monthly Grid. OMG I cannot even tell you how much I love how this page turned out! After a quick and total mess up the first go around, I got the Foxy bujo stamps to line up right. This definitely takes more time than last month’s grid which was just drawn with lines, but I love the way it looks. I added the highlight of some colored pencil and the numbers in light gray Tombow marker. Since I use Google calendar for events, here I will jot down various Instagram challenges, blog posts, etc so I can focus spare time on these upcoming posts. Stamping Tip: These clear stamps are so wonderful, make sure you get an acrylic block from a local arts store, or some other clear plastic. Once you stick the clear stamp to the block, you can see exactly where you’re stamping – which hypothetically makes it easier…. hypothetically (LOL). Monthly Task & Project Log: Okay this might be my favorite page ever. This helps me do a few things – continue using the loosely categorized Rapid Log for tasks due “sometime this month” and tracking my projects. Summer is high tide for my job and I have the blessing and the chaos of keeping track of 203409834 projects – so I used some big Hexagon stamps, one for each project I’m focusing on in July. The shaded ones are my top priority projects with some key next steps I want to accomplish this month. Tip: Make sure you use the right size to get the pattern you want… I used one too big last month and it didn’t fit well! Want to see more of my project planning ideas? See my work post, project post, and some other ideas from my freelance post. Weekly. I used to do a 7-day weekly ala TinyRayofSunshine, but I realized I used weekdays and weekends very differently in my bullet journal. So, a couple months ago I split them up in order to separate their function. These 5 days can focus on my standard work week – my priority tasks above the dotted line, date-specific tasks in the main body, gratitude log in the 2nd row, expenses in the 3rd row. My weekly habit tracker stamp (from Aetelier Dreams) has been awesome. The space on the left is for “sometime this week” tasks and on the right is open for any projects that I happen to be working on. Weekend. And the companion to the weekly is the weekend – it’s been working so much better to have this mimic my weekly set up with the main task area, and gratitude and expense sections. I either usually take it easy on weekends and barely touch it, or it’s a huge to-do list. The opposite page can be used for just about anything – brain dump, mind map, sketching, or review. I hope to share some more photos of collections and things I’m using to organize my life this summer! What are you up to this month in your bullet journal? Let me know down below! THAT MONTHLY GRID! That is brilliant! Love your set-up. Watched the video and I am anticipating the class you are talking about, being a Twin Cities girl. I hope to have things settled on what I’m teaching! It sounds like lettering in your planner (or other things) will be first. I don’t know if they believe me when I say brush calligraphy is a THING! Hey Jessica, What are you using to practice your Swedish? I’m Swedish American and I’ll be visiting (hopefully) Sweden next March. I’m currently using duolingo but would love to hear other options as well! Love the monthly spread. I’m excited to see how it works for you in July. In case anyone is interested in this canvas pencil case, it’s on eBay!